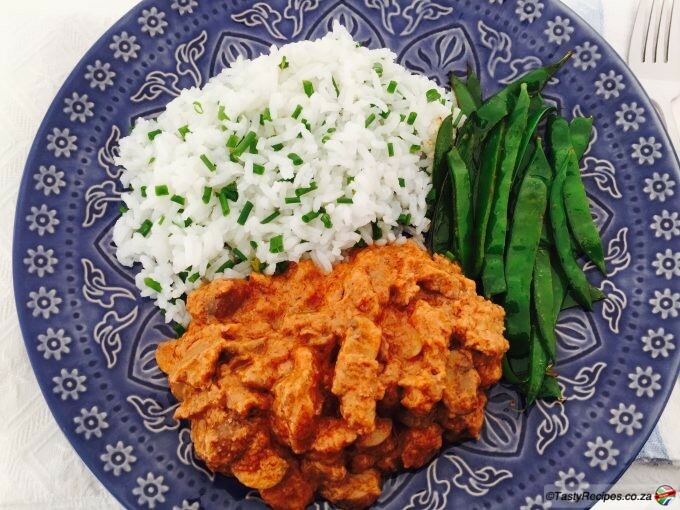 With the cooler weather approaching take comfort food up a notch and serve this hearty stroganoff which originated in Russia, but is definitely a South African favourite ! Tender juicy strips of beef and sliced mushrooms sautéed in butter and then swirled with sour cream to make a creamy sauce and served over mashed potatoes or rice. It’s not diet food, but it will make you smile 🙂 One important thing to note is that if you add cold sour cream to a hot liquid it will curdle therefore it is important to temper the sour cream by slowly introducing hot cooking liquid to the cream until it is warm before adding it to the pan. Cut the steak across the grain into strips and season with salt and pepper. Brown the beef in batches in a dash of hot oil in a sauté pan. You want to cook the beef quickly, browning on each side, so the temp needs to be high enough to brown the beef. Add the mushrooms to the same pan and sauté until cooked. Melt butter in same pan over medium-high heat until foaming. Add the onion, ginger & garlic and paprika and cook, stirring, for 5 minutes or until onion softens. Add the beef stock and the corn flour mix. Leave to simmer for 5-10 minutes or until the sauce has thickened. Taste the sauce for seasoning then return the beef and mushrooms to the pan. Reduce heat to low and simmer for another 10-15 mins mins then gradually stir in sour cream. Serve with fluffy mash potatoes or white rice.